I'm Joel McDonald & if you can't tell from looking around this site, I do one thing, and one thing only: AdWords. Whether you are looking for a new AdWords manager, or are looking for someone to help your in-house team get more out of AdWords, let's talk and see if it's a good fit for us to work together. AdWords should be the foundation of every single business. So many people look at adwords as an expensive form of advertising, and if it is only used to generate traffic – it can be. However – AdWords is so much more than just another form of traffic. Whether you have a big buisness, or a mom & pop shop, whether you’re online or not – if you’re not using AdWords to increase sales, you’re missing out. Adwords as a market research tool. If just starting your business or website, there is no tool out there that can get you more traffic, more quickly. If you’re planning on doing SEO for your website to get all of that “free traffic”, you could use AdWords first to verify that once you do make it to the first page of Google – that you’ll actually make a sale. Because AdWords visitors usually have higher odds of conversion than organic results, you’ll know that if you can’t make a sale from your AdWords visitors, you likely won’t make a sale with your organic visitors either. Think of all the blood, sweat & tears you’ll save yourself by finding out that information up front! AdWords as a profit multiplier. Do you run phone book ads? How about a mailing list? Any form of advertising you do likely has a call to action of some sorts, and it can be improved upon, but how? With AdWords, if you’re using it like it should be used, you should always be split testing multiple ads, and guess what? If your “Get a free online quote” ad gets 2x or 3x more sales for you than your “We’ve got the lowest rates in town” ad — you can emulate that ad in all of your other marketing channels. 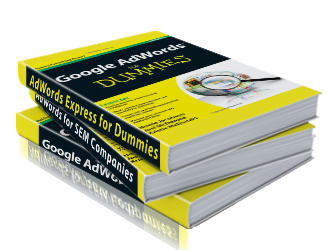 Suddenly, your $500 per month AdWords ad that is bringing in $1000 or $2000 in sales, can turn your yellow page ad that brings in $100,000 in sales – into a yellow page ad that brings in $200,000 or $300,000 in sales. Those are just a couple examples. There are dozens of ways AdWords can not just increase your company’s profits, but multiply them exponentially! Again – I’m biased because AdWords has changed my life, and the lives of those who depend on me for their livelihood. The question is whether or not you’re using it to its fullest potential so it can change your life.